I’ve recently heard people sing the wonders of riced cauliflower as a healthy substitute for traditional white rice. 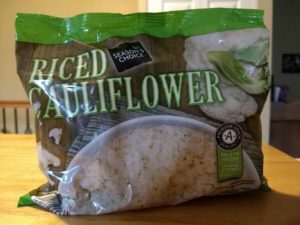 Aldi sells riced cauliflower, and it appears to be a Regular Buy that is available all the time. At my store it cost $1.89 for a 12-oz. bag at the time of publication. Riced cauliflower is ideal served alongside stir fry or other Asian-inspired food, or it can be served with meatballs, stews, pork, chicken, beef, curry dishes, and more. 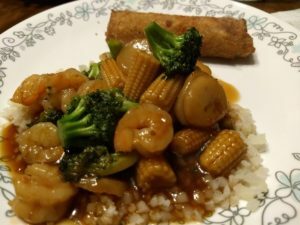 The first time my family ate riced cauliflower, I opted to serve it with a stir fry using shrimp, fresh broccoli, and Teriyaki sauce purchased from Aldi. 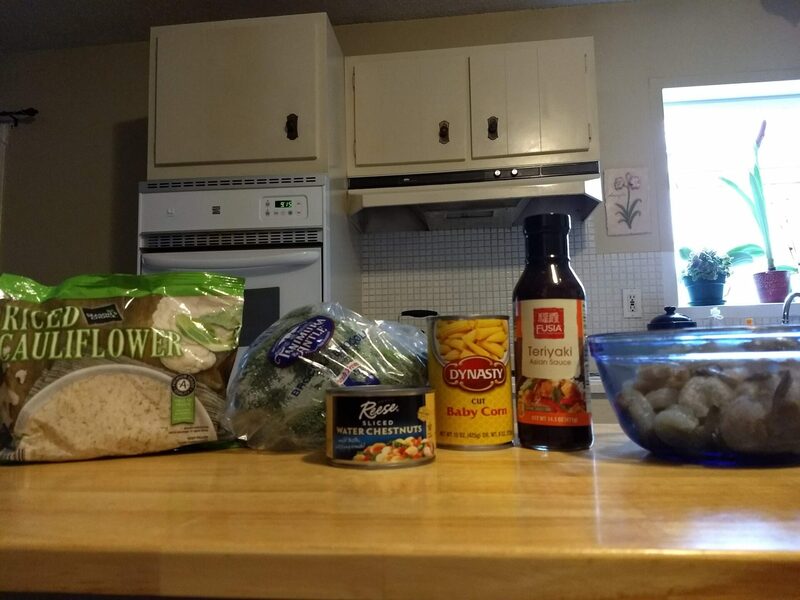 I also purchased baby corn and water chestnuts from a regular grocery store (Aldi sometimes sells jars of baby corn and cans of water chestnuts as ALDI Finds [Special Buys], but my stores haven’t sold them in a while, so I was out of stock at home). Season’s Choice Riced Cauliflower is sold in the freezer section. It comes all the way from Italy and is labeled Premium Grade Quality with a “Field to Frozen” seal indicating “locked in freshness.” It’s also advertised as having no preservatives. Ingredients are: precooked cauliflower and salt. One 3/4 cup serving nets you 20 calories, 0 grams of fat, 0 mg of cholesterol, 70 mg of sodium, 3 grams of total carbohydrates (2 grams of dietary fiber and 1 gram of sugar), and 1 gram of protein. The bag says to keep the riced cauliflower frozen until ready to cook. Preparing it is easier than I anticipated. You can microwave it or prepare it on the stove top. To microwave it, pour the desired amount of cauliflower into a bowl, and cook uncovered on high until heated through and water is absorbed, about 3 to 4 minutes. Directions are based on an 1100 watt microwave, so cooking times may vary depending on microwave wattage and depending on how much cauliflower you’re cooking. To prepare on the stove top, pour the frozen cauliflower into a nonstick pan and heat over medium heat until heated through and any water has cooked off, about 5 minutes. I prepared our cauliflower in the microwave. The cauliflower had frozen together into a large block, and I had to whack it on the counter a few times to break it up. Then I poured about half of the bag into a glass bowl and microwaved it for about 3 minutes. We ate the cauliflower topped with our shrimp stir fry. We don’t often eat stir fry with rice, instead opting to eat the stir fry on its own to reduce our carb intake, so my family may not be the best at comparing this to traditional rice. In fact, no one in my family is a big rice eater whether we’re talking about Asian-inspired food or American-style chicken and rice types of dishes, so that does color my family’s judgment of the riced cauliflower. 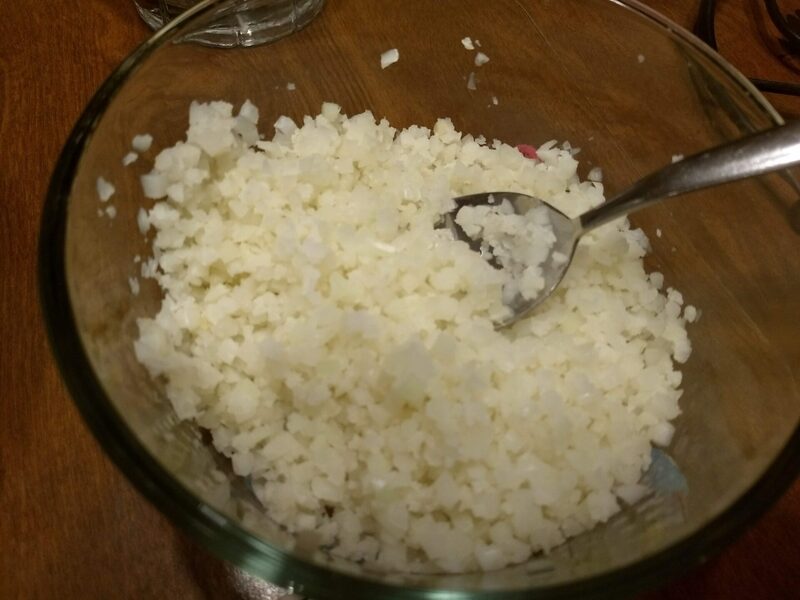 My family ate the riced cauliflower, although they didn’t eat a lot of it and didn’t go for seconds. I didn’t notice the riced cauliflower much in my own serving. It seemed to blend in well with the broccoli and other veggies. Because I only served half of the bag for our stir fry meal, I still have leftover riced cauliflower in the freezer. I later heated a single serving of cauliflower for myself when I prepared a bag of Fusia chicken with sauce for my family. It was easy to dump the portion size I wanted into a microwave-safe bowl, and it only needed to heat for about one minute in the microwave because it was a smaller amount. I thought the cauliflower went well with the sauced chicken, but the rest of my family passed on the cauliflower. Overall, I am happy with it, but I’m not sure how often I’ll serve it in the future given my family’s lukewarm reaction. That’s not necessarily a reflection on the quality of the cauliflower. Aldi’s Regular Buy Season’s Choice Riced Cauliflower is a healthy alternative to white rice in a lot of meals. If you’re looking to add more vegetables to your diet and/or reduce your carbs, try the riced cauliflower with a stir fry or other meal.